The U.S. stock market is facing a severe volatility since the last couple of months despite a strong start this year. This downside can mainly be attributable to a potentially damaging trade war between the world’s two largest economies, United States and China, since this February. After President Trump announced plans to impose tariffs on up to $60 billion of annual Chinese imports, China retaliated by revealing plans to levy tariffs on 128 U.S. products. This fall-out has sparked worries of a possible trade feud between the two countries. Moreover, weakness in large-cap tech stocks is cited as another reason for this free fall. Further, the S&P 500 Index has registered a decline of 7.7% since the second month of 2018. Similarly, after a solid run in the first two months of the first quarter, the drug/biotech sector struggled in March, probably due to broader market pressures. Also, we fathom that a few negative updates on the pipeline and regulatory front have slackened its growth momentum. The biotech industry has declined 7.4% so far this year. Moreover, the sector has underperformed the S&P 500 index’s 0.6% decrease. Despite the recent market volatility, a buzz of optimism revolves around the remaining year. Keeping this sentiment in mind, we highlight three stocks that might prove to be good buys for investors’ portfolio. Evidently, each stock sports a bullish Zacks Rank #1 (Strong Buy) or #2 (Buy) and has seen its share price rise in the last 30 days in spite of the market downturn. Moreover, the stocks witnessed a positive estimate revision during the period. Meanwhile, the biotech sector is likely to improve as the year progresses. We expect a surge in new product sales in sync with rising demand. This apart, a successful innovation and product line expansion, strong clinical study results, more frequent FDA approvals, consistently strong performance of key products, growing demand for drugs especially to address rare-to-treat diseases, a greying populace and an increased healthcare spending are some of the factors that should keep the sector on track. 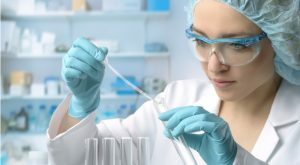 Shares of Bellerophon Therapeutics Inc (NASDAQ:BLPH)have rallied 15.9% in the past month against the industry’s decrease of 6.9%.Additionally, the stock has seen the Zacks Consensus Estimate of a loss for 2018 and 2019 being narrowed 49% and 48.7%, respectively, in the last 30 days. This Zacks Rank #2 stockis expected to record earnings growth of 44% this year. Novavax, Inc. (NASDAQ:NVAX) carries a Zacks Rank of 2. Loss estimates for the company have been narrowed 5% for 2018 and 14.9% for 2019 over the last 30 days. The biotech stock’s sales and earnings growth for this year is projected at 34.9% and 9.5%, respectively. Shares of Novavax have gained 2.5% in the past month versus the industry’s decline. Shares of No. 2-ranked Oncomed Pharmaceuticals Inc (NASDAQ:OMED) have risen 9.7% in the past one month, outperforming the industry’s fall. The consensus mark of a loss for 2018 and 2019 has been narrowed 20.7% and 13.7%, respectively, over the past 30 days. This company is estimated to record sales and earnings growth of around 32.8% and 7.69%, respectively, in 2018. Article printed from InvestorPlace Media, https://investorplace.com/2018/04/3-biotech-stocks-thrive-amid-market-instability-ggsyn/.